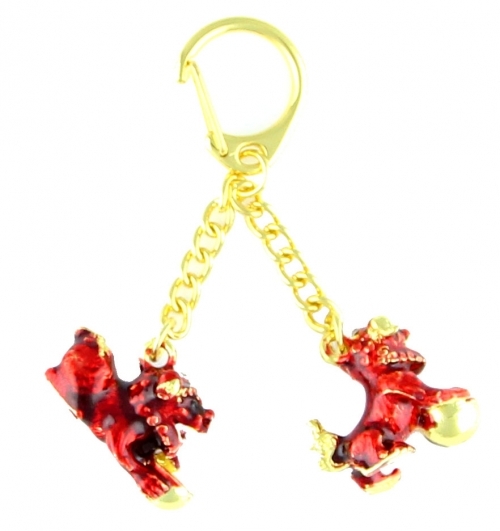 Carry this beautiful Tzi Chi Kau Red Dog Amulet Keychain with you to protect yourself from the malevolence brought on by the #3 Star in 2018. Designed with fine craftsmanship, this amulet keychain features a pair of Red Tzi Chi Kau, rich color, and thick, sturdy chains. Dazzling in rich red and gold, this pair of Bejeweled Red Tzi Chi Kau (also known as fu dogs) will bring in auspicious fortune and successful growth ! The red fu dogs eliminate the harmful energies of the #3 Star that indicate conflict and misfortune. Carrying this amulet keychain in your purse, wallet, car, clothing, etc. will increase positive energies and keep all your relationships friendly and peaceful. In 2018, the malicious #3 Star is especially strong if your home faces the Northeast. Thus, place this powerful cure (like a Tzi Chi Kau Red Dog statue) in the Northeast sector of your home or workplace to protect against misfortune and hostility. Feng Shui Fu dogs are also called foo dogs. “Foh” in Chinese means Buddha, and these legendary animals are widely seen in front of Buddhist temples, palaces, homes, and homes of the royal. Because of their strength and legendary power, Foo dogs are also commonly embroidered on robes of ancient Chinese royalty and officials. These beautiful creatures are considered sacred in Buddhism and Chinese culture, and are a symbol of wisdom, protection, power and positive chi. Foo dogs are believed to guard against evil spirits and harmful chi from entering the house. The dimension of each red dog amulet is approx. 1.25" x 0.75" x 0.5". The overall length of the whole red dog keychain is approx. 3.5". It is made of copper and can be either displayed on the table or hanged on the wall.